“A live-looping frenzy", classically-trained singer-songwriter Sophia Exiner, also known as Phia, makes music that is abound with luscious layers of harmonies, vocal percussion and vivid pop sensibilities. She has honed her remarkable live show over hundreds of performances across Europe, from bars in Southern Italy, to fisherman’s villages in Iceland and major music festivals such as Melt Festival, Berlin Festival and Fusion Festival in Germany. She has also performed on national television in Australia (Spicks & Specks) and Germany (TV Noir). Her newest release is The Woman Who Counted The Stars EP, described as “a cosmic experience buzzing with sonic energy” (Happy Mag) and "Flowing from [...] minimal loops to stadium-scaled grandeur” by Rolling Stone Magazine (Australia). The new EP enscapsulates Phia’s ferocious creativity, with the five tracks brimming with layers of glitter and grit, heralding the arrival of a bold new sound for the Melbourne-born singer- songwriter. Pulsing, distorted drums and intergalactic juno synths collide with fuzz guitar and vintage casio keyboards, as Phia’s longtime production collaborator Josh The Cat realises a sonic vision that manages to be both lush, raw, and emotionally affecting. 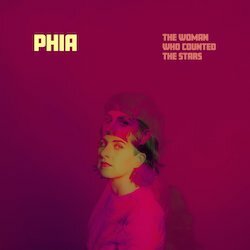 Phia’s effortlessly charismatic, crystal-clear vocal soars in a song inspired by Vera Rubin, the astronomer who studied the rotation and outer reaches of galaxies, and discovered the first compelling evidence that supported the theory of dark matter.A perfect piece of galactic-pop.